Standard campaign statuses are essential to have consistent reports within Salesforce, but there’s no easy way to bulk create new statuses within the UI. In this tutorial, I’ll show you how to bulk create campaign member statuses in Salesforce using the Data Loader. The first step is to create a Salesforce report of all the campaigns you want to update. You will need all the campaign IDs as well as the campaign type (online advertising, webinar, email blast, etc) if you want to update the statuses based on campaign type. Export the report as a CSV file. I recommend using all 5 of these fields, but only Campaign ID and Member Status will be required to create the statuses. Here’s an example of a file that is ready to be uploaded. If you don’t already have Data Loader installed on your computer, login to your Salesforce instance navigate to setup and search Data Loader using the quick find. Follow the instructions to install Data Loader on your computer. Once you have Data Loader installed, you can upload your campaign member statuses. To do this, click on the Insert button and login using your Salesforce credentials. 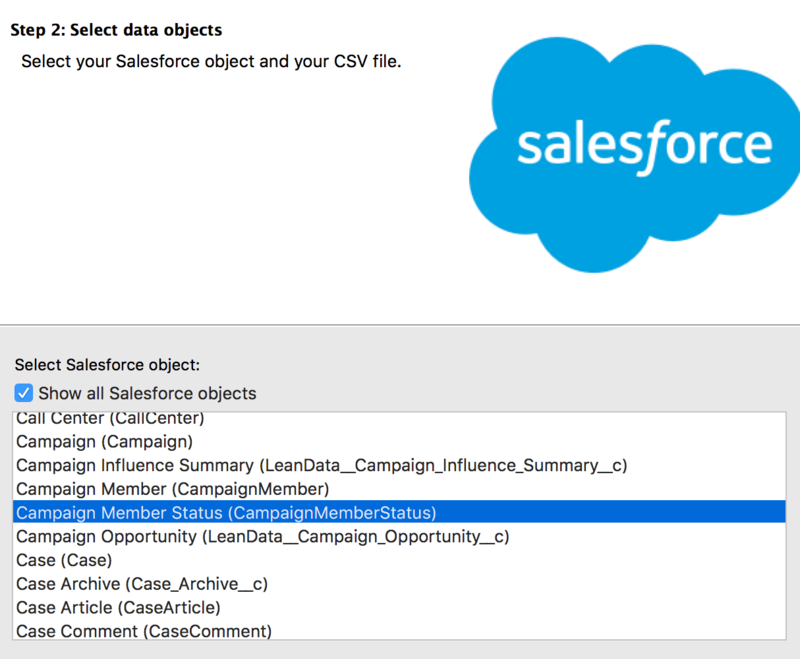 When prompted to select your Salesforce data object, check “Show all Salesforce objects” and select Campaign Member Status as your object. Select your CSV file and click next. Map the available fields to the columns in your CSV file and click next to start the import. Hey, great article. This will be really helpful thanks. Do you know of a way to pull a report to show Campaigns with all member statuses, and whether or not the status is default or responded? Thanks.